In the spirit of working on UFOs, let me update you on the progress of the Sock Yarn Blanket, aka my Albatross. As you can see from the layout, it's moving along. I'm actually starting to think that maybe this puppy might see the end of the line in this century. I am ignoring the fact that I still have to fill in all those little triangles around the edges. Denial is a wonderful thing. And here's the stash of sock yarn scraps waiting for incorporation. Many thanks to everyone who has contributed to the pile. I may end up not having to repeat yarns, which would be awe-inspiring. Boo's birthday is at the end of the month. I'd like to pretend this will be done by then, but I suspect this will be a "Welcome to London" present for her instead. So be it. 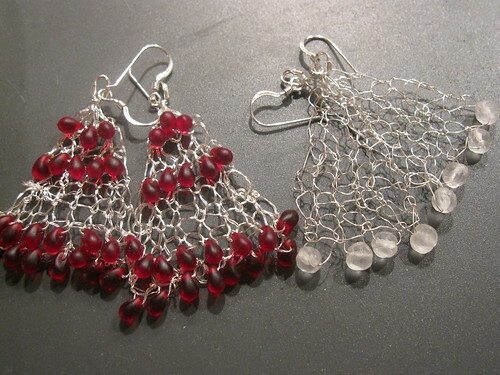 Yarn: 30 gauge sterling silver wire (white beads) and 32 gauge silver-plated Artistic Wire (red beads), very small amounts of each, beads from here. Comments: OK, knitting with wire is weird, but strangely satisfying (hello instant blocking!). These two pairs took me less then two hours to do, even with Alias Season 1 on the tube. I ordered the wire in December, hoping to have them done for Christmas presents, but it arrived two days after we went North, so no dice. I love them, and have ideas for all sorts of other incarnations for future gifts. Quick, easy, and gorgeous - what could be better? Written by porpoise On February 4, 2009 In "FO", "Sock Yarn Blanket", "beads"